Medicinal plants that are used by traditional healers but are not recorded in classical texts of Ayurveda are designated as Anukta Dravya or extrapharmacopoeial plants. Various parts of Biraskala, botanically identified as Dalbergia volubilis Roxb. belonging to fabaceae family, have been reported for their ethnopharmacological properties. Juice of its roots is used for gonorrhea and the aerial part is applied as diuretics. The roots are also used as genitourinary tract disinfectant, scalding of urine, and also for fetid discharges. Small pieces of fresh root are ground to make paste and chewed with a pinch of salt to cure dental pain and caries. The stem bark paste is mixed with half cup of water and administered to cure blood dysentery and menorrhagia. D. volubilis is a woody climbing unarmed inland shrub with pinnatified leaves, leaflets ranging from 7 to 13 and pale blue flowers., Review of literature reveals that few work has been reported on Dalbergia genus which includes review on chemical constituents, ethnobotanical claims, pharmacology biological activities, and DNA barcoding of various species of Dalbergia. Although various parts of plants are used ethnobotanically, the plant is yet to be evaluated, in a scientific way, for its anatomical characters and phytochemical constituents. Hence, in present study, the root and stem of D. volubilis are explored to bring insight on the root and stem anatomy and preliminary phytochemical constituents and high-performance thin-layer chromatography (HPTLC) profile. Root and stem samples were collected by the first and second authors from one of its natural habitat, Gandhamardan hills, Odisha, in the month of September 2016 with help of local taxonomist. Herbarium was submitted to pharmacognosy laboratory authenticated by the pharmacognosist of the IPGT and RA, Jamnagar and provided with herbarium reference no. 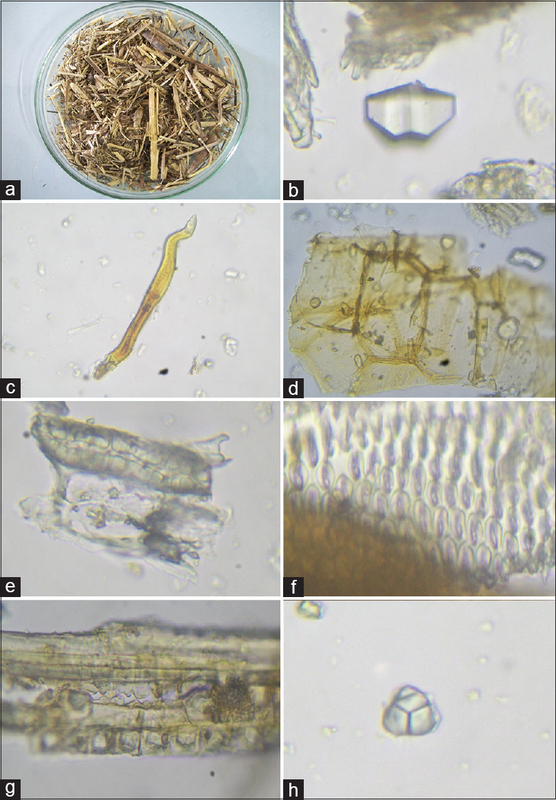 PHM/6199/2016-17 [Figure 1]a, [Figure 1]b, [Figure 1]c, [Figure 1]d.
Macroscopic observations were made with naked eyes, and centimeter scale was used to measure the root and stem length. The cut pieces of root and stem were washed and transverse sections were taken cleared with chloral hydrate to observe the anatomy of root and stem with help of Quasmo binocular compound microscope. 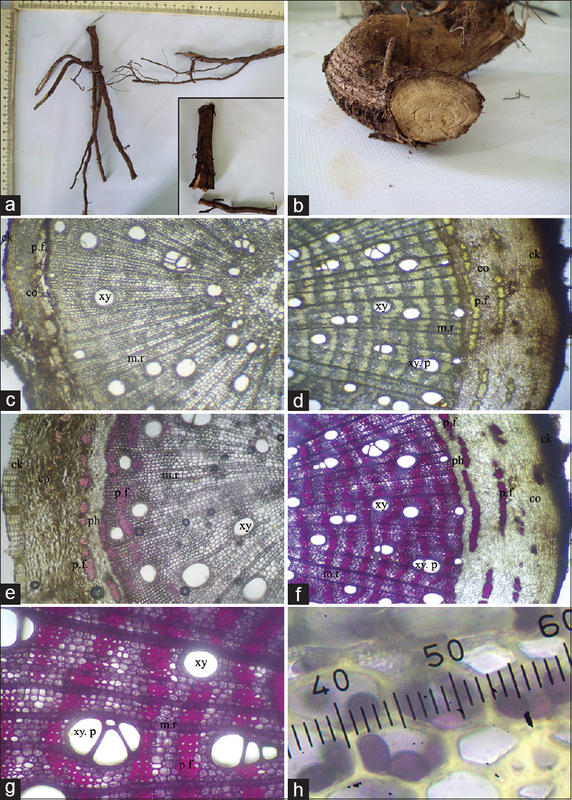 For histochemical tests, the thick transverse sections of the root were exposed to idoine, phloroglucinol and HCl for observation of starch grain and lignified tissue. For powder microscopy, to obtain powder, shade dried cut pieces of root and stem (young and mature) were grounded by mechanical grinder and sieved through 80#. For micrometry, triplicate readings were recorded and mean value was taken into consideration. The total phenolic content of the extract was estimated according to the method described by Singleton and Rossi. The concentration of methanolic extract solution was 10 mg/10 ml. From this solution, 1 ml was taken in test tubes and was diluted with the same solvent up to 10 ml. This is stock solution. From stock solution, different concentrations were taken in different test tubes. This same procedure was used for standard. Gallic acid (Loba Chemie Pvt. Ltd., Mumbai) was used as a standard; 1 ml of Folin–Ciocalteu reagent was added in this concentration, and the content of the flask was mixed thoroughly and 5 min later, 4 ml of 20% sodium carbonate was added, and the mixture was allowed to stand for 30 min with intermittent shaking. The absorbance of the blue color that developed was read at 765 nm in ultraviolet (UV) spectrophotometer. Methonalic extract of root and stem was exposed to HPTLC study. The solvent system used for the study was toluene: ethyl acetate (9:1). Application mode was Camag Linomat V; Development Chamber used was of Camag Twin trough Chamber. Precoated silica gel plates were used. Chamber saturation was done for 30 min. Development time was 30 min. The plate was scanned in Camag Scanner 3 with deuterium lamp and tungsten lamp as detectors and winCATS software was used for data analysis. 0.5 g vanillin was dissolved in 100 ml sulfuric acid–ethanol (40 + 10). After spraying, the plate was heated at 120°C until maximum spot color intensity was reached. The root system consists of stout woody taproot and its lateral branches. Length width of roots (cut pieces) ranges from 11 to 20 cm × 0.3–5.5 cm (diameter). Externally, root creamish brown to dark brown along with longitudinal striations is devoid of lenticels; inner part of the root is creamish, woody texture showing porous nature as secondary growth is prominent. Odor characteristic and slightly pungent, touch is rough due to outer bark striated. Fracture is hard, fibrous and woody [Figure 2]a and [Figure 2]b. The young stem is greenish which on drying turns maroon or dark brown along with hollow space in center. The stem is with proper nodes and internodes, sometimes not erect as it is a climber. Mature stem is dark brown to maroon color and possesses light brown lenticels on outer surface. Fracture is short and fibrous. Stem shows thick greenish brown-colored hooks for climbing. The cut pieces of stem measure about 14.8–16.9 cm × 0.7–2 cm [Figure 3]a.
Diagrammatic TS of root is almost circular with outline more or less regular. Outermost layer consists of multilayered cork, followed by reduced cortex and well-developed centrally located secondary xylem and phloem along with medullary rays. The detailed TS shows outermost layer is the cork composed of 6–9 rows of narrow tangentially elongated compactly arranged cells; some cells are filled with brown content, followed by reduced cortex which consists of the parenchymatous cells inner to the cork. The cortical cells are devoid of any cellular contents. Development of secondary phloem is observed alternative with that of pericyclic fibers forming a discontinuous ring, resulting in reduction of the cortical zone. The wood occupies 80% of the diameter of root. The well-developed meta-xylem situated toward cortical region is enriched with ergastic substance and tylosis is observed in initial stages. The xylem vessels are separated by the uniseriate medullary rays. Medullary rays are embedded with starch grains, start from center and reaches up to the inner parts of the cortex. The xylem is radially arranged with xylem parenchyma and its fiber. The protoxylem is observed in lower region of the TS of the root. Meta-xylem shows intraxylary pitting and often filled with brown content. Group of starch grains are found throughout the TS, especially in medullary rays and in surrounding regions of xylem parenchyma cells. Rhomboidal crystals and prismatic crystals are found near the pericycle, also in the parenchymatous cells beneath the cork layer [Figure 2]c, [Figure 2]d, [Figure 2]e, [Figure 2]f, [Figure 2]g, [Figure 2]h.
The schematic TS of young stem shows single-layered epidermis with cuticle followed by the cortex, circularly arranged isolated pericyclic fibers, open and collateral vascular bundles, and central large pith. Detailed TS of young stem shows single layer of epidermal cells covered with cuticle followed by 10–12 layers of cortical cells often filled with chlorophyll contents and sometimes with prismatic crystals of calcium oxalate. Isolated pericyclic fibers are embedded in cortex, which are radially arranged, followed by phloem, xylem, and medullary rays. Xylem consists of xylem parenchyma and its fibers, few xylem show intraxylary pitting. Medullary rays are exclusively uniseriate and embedded with starch grains. Pith occupies around 50% of the total TS. The parenchymatous pith cells adjacent to vascular bundles are pitted and lignified. The schematic TS of mature stem shows multilayered cork, followed by reduced cortex, pericyclic fibers, secondary phloem and xylem, and centrally located small pith. Detailed TS shows multilayered tabular cork cells filled with dark brown content. Cortex is reduced and pericyclic fibers embedded in this region also show tints of brown content. Cortex is followed by several layers of secondary phloem and xylem along with exclusive uniseriate medullary rays filled with starch grains and it occupies around 75%–80% of TS. The xylem consists of xylem parenchyma and its fiber. Phloem is present in between xylem which signifies as interxylary phloem. 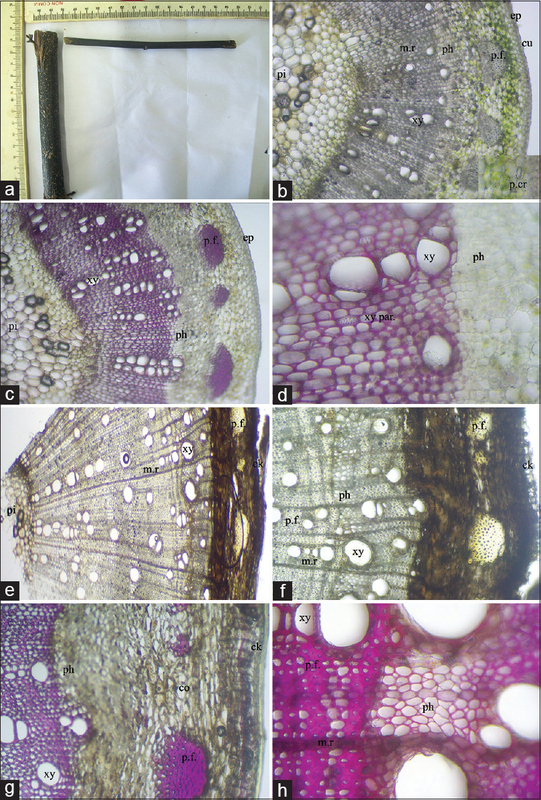 Central pith occupies 20%–25% of TS, pith consists of loosely arranged parenchyma cells are lignified [Figure 3]b, [Figure 3]c, [Figure 3]d, [Figure 3]e, [Figure 3]f, [Figure 3]g, [Figure 3]h.
The root powder is yellowish brown in color with characteristic slight pungent odor, astringent in taste and fibrous rough in texture. The stem powder is brownish yellow in color with characteristic odor, initially sweet followed by bitter taste and fibrous rough in texture. The root powder shows the presence of cork cells in surface view, rhomboidal crystal measures 0.6 μm × 0.5 μm and simple and compound starch grains measure 0.6 μm2 in diameter 0.5 μm × 1 μm, respectively; pleuricellular trichome measures 1 μm × 0.4 μm at × 40, pitted vessel, brown content, fragment of lignified parenchyma cells embedded with starch grains, lignified simple fiber and crystal fiber. The stem powder shows the presence of simple starch grains with concentric lines measure 0.3–0.4 μm2, compound starch grains measure 0.5 μm × 0.5 μm, rhomboidal crystals measure 0.7 μm × 0.6 μm, fragment of tannin-filled trichomes measures 5 μm × 0.4 μm, oil globules measure μm ×40, simple fibers, fibers passing through medullary rays, sclereids, fragment of boarded pitted vessels and spiral vessel [Figure 4]a, [Figure 4]b, [Figure 4]c, [Figure 4]d, [Figure 4]e, [Figure 4]f, [Figure 4]g, [Figure 4]h and [Figure 5]a, [Figure 5]b, [Figure 5]c, [Figure 5]d, [Figure 5]e, [Figure 5]f, [Figure 5]g, [Figure 5]h.
The results of physicochemical parameters show that foreign matter is absent in root and stem parts and other values are mentioned in [Table 1]. 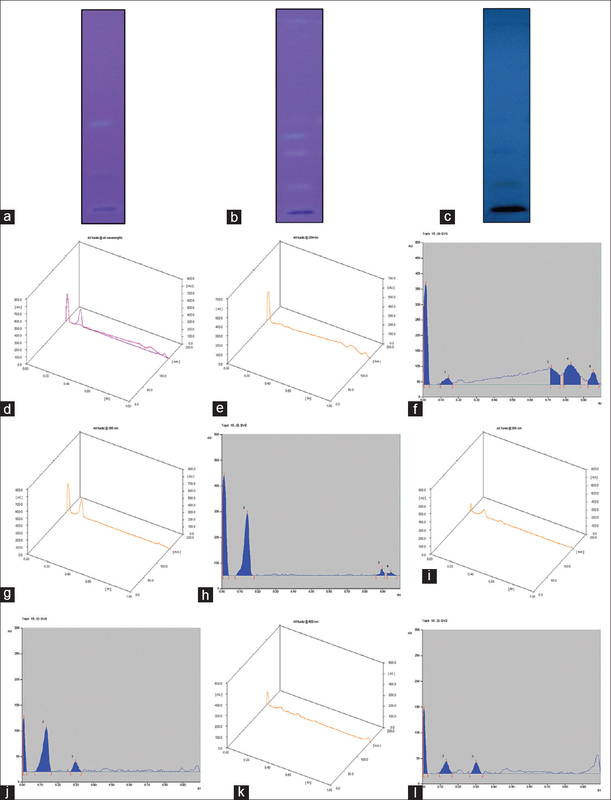 Qualitative analysis reveals the presence of carbohydrates in all the samples whereas alkaloid is present only in root extracts; the other tests results are mentioned in [Table 2]. The total phenolic content of methonalic extract of D. volubilis calculated as gallic acid equivalent of phenols was detected. The details of absorbance and concentration of standard as well as samples are given in [Table 3]. The linear graph was obtained in standard and R2 was found to be 0.989. The concentration is 0.216 μg/ml in methanolic extract of root and that of in stem is 0.217 μg/ml. The methanol extract of root shows 9 peaks, 9 peaks, and 6 peaks and stem shows 5 peaks, 4 peaks and 3 peaks at UV visible range of 254 nm, 366 nm and 600, nm, respectively. After spraying with spray reagent, root shows 9 peaks and stem shows 3 peaks that are obtained at 366 nm. The Rf values are presented in [Table 4] and the photographs and peak display are shown in [Figure 6]a, [Figure 6]b, [Figure 6]c, [Figure 6]e, [Figure 6]f, [Figure 6]g, [Figure 6]h, [Figure 6]i, [Figure 6]j, [Figure 6]k, [Figure 6]l and [Figure 7]a, [Figure 7]b, [Figure 7]c, [Figure 7]d, [Figure 7]e, [Figure 7]f, [Figure 7]g, [Figure 7]h, [Figure 7]i, [Figure 7]j,[Figure 7]k, [Figure 7]l. The similar Rf obtained at 254 is 0.95 and 366 nm is 0.82, 0.94 and 0.95, respectively. The comparative spectra are shown in [Figure 8]a, [Figure 8]b, [Figure 8]c, [Figure 8]d.
D. volubilis Roxb. is a woody climbing unarmed inland shrub, with the presence of hooks, compound leaf and pulvinus rachis base. This key field identification character of the plant may help to identify the plant in its natural habitat. Externally, the root is creamish to dark brown in color, whereas internally, it is creamish. Stem shows thick greenish brown-colored hooks for climbing. Stem along with hooks on drying becomes maroon to dark brown colored. Microscopic characters of roots such as the presence of tannin, oil globules and tylosis development are important characters for identification. 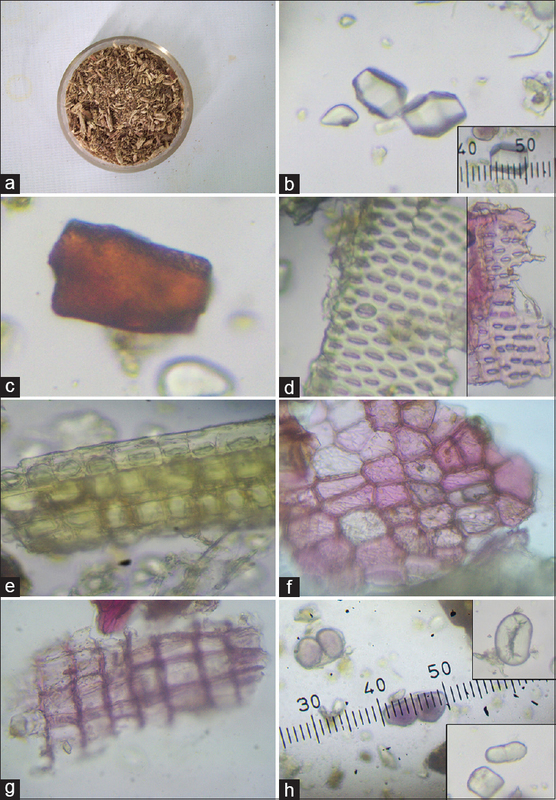 Microscopic features of TS of stem show tannin-filled trichome and inter-xylary phloem which are special characters of Dalbergia genus. The results obtained from physicochemical, qualitative and quantitative analyses will help in further standardization of the plant. Qualitative test shows the presence of carbohydrate or sugar in root and stem which may be indicative for the presence of isoflavone apioglucoside which is rare sugar moiety and considered as chemotaxonomic marker found in Dalbergia genus. The comparative spectra at similar Rf obtained from HPTLC study may be indicative for the presence of similar chemical moiety in root and stem which could be useful for further standardization of biomarker for this plant. D. volubilis Roxb. is a woody climbing unarmed inland shrub with climbing hooks, the key field identification character of the plant. Typical characteristic of D. volubilis root is abundance of starch grain. Presence of brown content and intraxylary pitting helps for identification of the plant. Stem shows hooks for climbing and the presence of interxylary phloem which is one of the rare anomalous growth patterns, tannin-filled trichome and crystal fiber are key identification characters. Physicochemical results and HPTLC results will help in further standardization and act as standards for assurance of quality. We would like to thank Director of IPGT and RA, Gujarat Ayurved University, Jamnagar, and Ministry of AYUSH, Government of India, for funding the project and all the supporting laboratory heads and staff members of IPGT and RA. This study was financially supported by Ministry of AYUSH, Government of India. Sanjib S, Jamil AS, Himangsu M, Faroque H, Anisuzzman, Mahadhi H, et al. Ethnomedicinal, phytochemical, and pharmacological profile of the genus Dalbergia L. (Fabaceae). Phytopharmacology 2013;4:291-346. Khare CP. Indian Medicinal Plants (An Illustrated Dictionary). 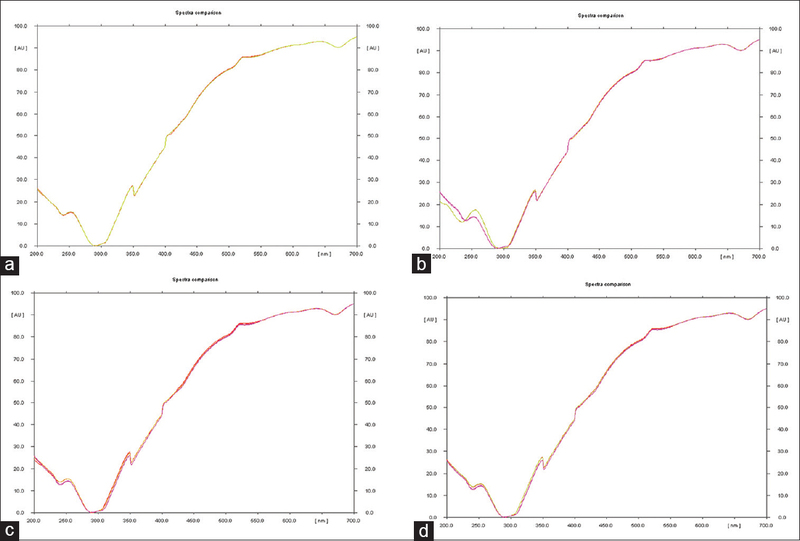 Berlin (Germany): Springer Publishers; 2007. p. 201-9. Koushik M, Datta BK. A study on ethano-medicinal usage of plants among the folklore herbalists and tripuri medical practitioners part–II. Natl Product Radiance 2007;6:66-73. Koteswara RJ, Seetharami RT, Aniel KO. Ethnobotany of stem bark of certain plants of Visakhapatnam district, Andhra Pradesh. Curr Bot 2011;2:1-6. Brahmam M, Saxena HO. Flora of Orissa. Vol. 1. Orissa: Regional Research Laboratory; 1994. p. 522. Gamble JS. Flora of the Presidency of Madras. Vol. 1. Dehradun: Bishensingh, Manhendra Pal Singh; 2011. p. 522. 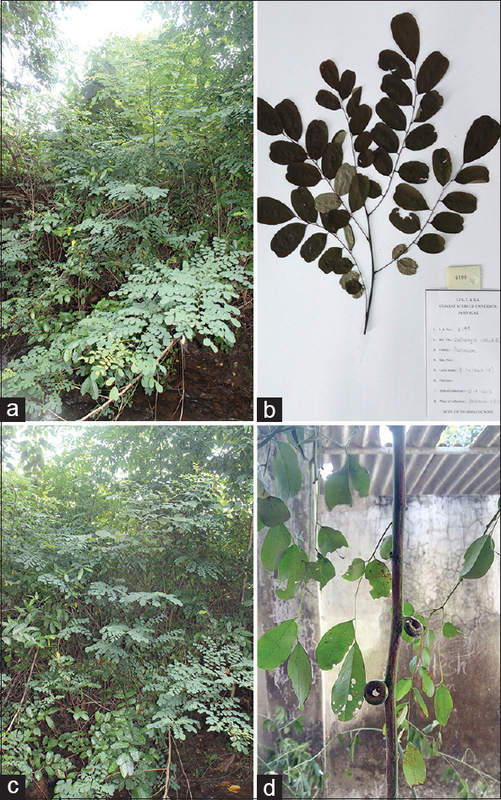 Neeru V, Manisha V, Sharma SK, Satish S. Chemistry and biological activities of the genus Dalbergia: A review. Phcog Rev 2009;3:30719. Hartvig I, Czako M, Kjær ED, Nielsen LR, Theilade I. 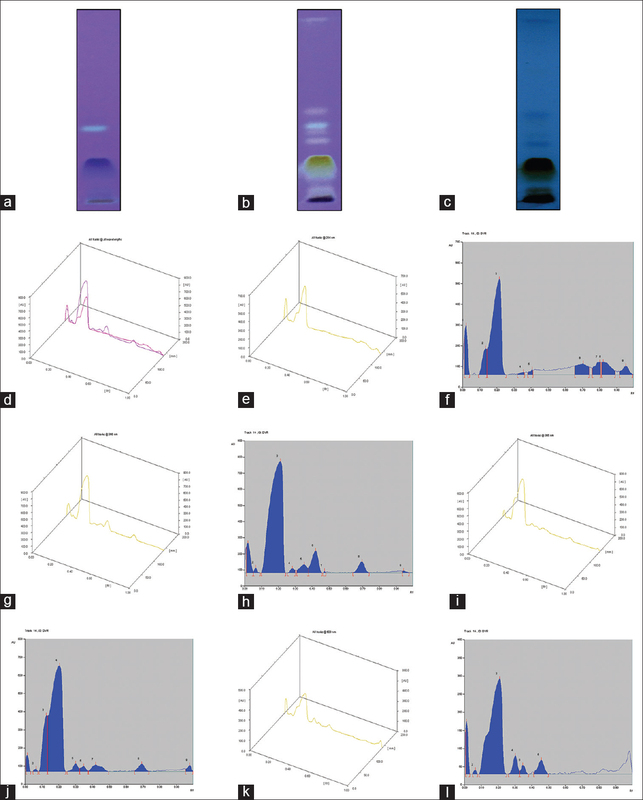 The use of DNA barcoding in identification and conservation of rosewood (Dalbergia spp.). PLoS One 2015;10:e0138231. Trease and Evans WC. Pharmacognosy. 16th edition. London: Saunders Elsevier; 2009. p. 567-68. The Ayurvedic Pharmacopoeia of India. Part. 2. Vol. 2. 1st edition. New Delhi: Government of India, Ministry of Health and Family Welfare, Department of AYUSH; 2008. p. 159-61. Khandelwal KR. Practical Pharmacognosy. 19th edition. Pune: Nirali Prakashan; 2008. p. 149. Nariya PB, Bhalodia NR, Shukla VJ, Acharya R, Nariya MB.In vitro evaluation of antioxidant activity of Cordia dichotoma (Forst f.) bark. Ayu 2013;34:124-8. Egon S. Thin Layer Chromatography. Berlin (Germany): Springer Publication; 2005. Metcalfe CR, Chalk L. Anatomy of the Dicotyledons. Vol. 1. Great Britain: Oxford University Press; 1950. p. 503, 527.